The game changed in Venezuela last night. What had been a slow-motion unravelling that had stretched out over many years went kinetic all of a sudden. If ever a case were to be made for the 2nd Amendment, it is being made right now in the streets of Venezuela. Soldiers shooting civilians in their homes, on the streets, in open view of the public: somehow, I believe they would not be doing so if the Venezuelans had the ability to offer armed resistance. Socialism: 100 years of failure means nothing. Barring any last minute stays, Tuesday will bring us the third execution of the year for Texas (and the only one scheduled for this month). 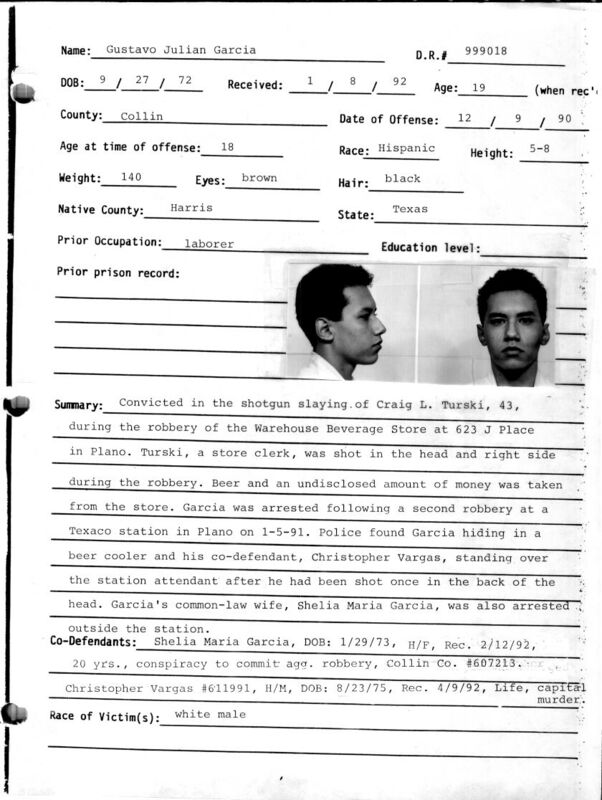 On December 9, 1990, up in Plano (DFW area where I live), Garcia and his thug partner Christopher Vargas went into a liquor store and proceeded to rob the clerk, Craig Turski. Garcia shot him once in the abdomen, he tried to run but they reloaded and shot him in the head. A customer who saw Garcia managed to leave and come back with her husband, they found the store deserted and called police. The clerk was found but died later. Nearly one month later (January 5, 1991) the thugs, now accompanied by Garcia’s girlfriend (also reported as his “common-law wife”, or “whore” as it used to be said) went to a Texaco in Plano and repeated the same thing. The clerk (Gregory Martin) happened to be on the phone with his girlfriend, warned her he was being robbed, and told her to call the police. Although his warnings weren’t enough to prevent his murder (Garcia was again the triggerman), they were enough to get the police there before the thugs could escape. Garcia confessed to both crimes and was tried on the Turski murder. (Vargas was tried for capital murder and sentenced to life; the whore tried for conspiracy to commit aggravated robbery and sentenced to 20 years.) As if two capital murders in less than a month weren’t enough of an indicator of future dangerousness, the prosecution brought up his multiple burglaries while a juvenile, his numerous disciplinary actions while in school, and the problems he created while in jail awaiting trial. Not surprisingly he was sentenced to death. However, Garcia managed to get his original sentencing phase overturned on federal habeas appeal in 2000. But not only were all the prior incidents rehashed at the second sentencing trial (March 2001), during his incarceration time Garcia tried to escape from prison in 1998, which of course was also used against him. (You think you might want to be a model prisoner so as to maybe get a life sentence the next time?) The second time was the same as the first (death sentence) but this time, ALL appeals were DENIED (the final appeal was DENIED the day before Masterson’s execution). Garcia’s demise is, again, way overdue: he’s been on death row (since 1992) longer than my SO’s daughter has been alive (born 1995).